In today’s challenging business environment, oil and gas companies must find ways to cut costs without compromising on quality, innovation, functionality or efficiency. For Byrne, a leading Equipment Rental Saudi company with depots across the kingdom, there has perhaps never been a better time for customers to realise the benefits of its bespoke systems, from quick-to-assemble fully managed turnkey mobile accommodation camps to space-saving, easily transportable modular office blocks and warehouses, temporary blast resistant modules for hazardous environments in refineries and petrochemical plants, and mechanical equipment. "Oil and gas companies recognise equipment rental as the way forward, and Byrne is synonymous with that. Companies which used to make capital equipment purchases find that they can get much better value from their operating expenditures, and that’s where the flexibility and convenience of Byrne’s systems really come into their own," says Satish Shetty, deputy general manager – Eastern Region, Saudi Arabia. The fully Saudi-owned company serves customers through a network of six fully equipped depots located on the doorsteps of major upstream and downstream oil and gas facilities in the Eastern, Western and Central Provinces, including large Saudi Aramco sites. This enables the company to guarantee rapid 24/7 response to customer needs, backed up by a team of 400-strong nationwide workforce. Shetty, who has been with Byrne for eight years in Saudi Arabia, says unrivalled flexibility defines the company’s value proposition. All the equipment in the fleet are customised to meet a customer’s exact needs and specifications, and can be rented for days, weeks, months or years. "Our high specification mobile oil and gas camps, which are assembled at our depots in the kingdom, are popular among Aramco’s upstream contractors and have seen service on remote sites from the Rub Al Khali to Turaif. "The fully managed camps are self-contained and include power, fresh water, mobile sewage treatment plants (including water recycling capability), offer comfortable sleeping accommodation, access and security huts, kitchens, canteens, gyms, mosques and even shops. "And because both mobilisation, and demobilisation of the systems is quick they are very cost effective," he adds. Byrne’s modular office blocks and warehouses, assembled at the company’s 40,000 square metre yard close to Saudi Aramco’s Berri Gas plant in Jubail, offer similar design flexibility and cost savings. "Modular blocks are much like Lego in that they can be configured in different ways to save space. You can stack as many as 10 blocks each 6 metres by 2.4 metres on one flatbed trailer, dramatically reducing transport costs," Shetty points out. "Plus, again we can assemble them in our yards or at client’s site in a matter of days." "Cost savings offered by Byrne’s systems are never achieved at the expense of quality. "All of our equipment meets Aramco standards and carries all relevant third party inspection reports. Our mechanical and diesel power equipment are manufactured by the world’s top three suppliers, and all equipment is regularly serviced and meticulously maintained by Byrne’s highly trained technicians who use only OEM parts and consumables, ensuring all pieces are robust, durable and reliable," he explains. It is for this reason that the company continues to meet the discerning needs not only of Aramco but also its contractors, and not just for the large mobile camps (Byrne is currently assembling a 1,000-person capacity camp at Aramco’s Fadhili project site ready for occupation in October 2016), modular blocks and warehouses for which it is most famous. Aramco also specifies specialised equipment from Byrne such as skid mounted boilers (total capacity of more than 40 tonnes per hour), oil-free compressors, dessicant dryers, lighting towers, power and cooling units and offshore containers and baskets for use across its network, from the central utilities plant at Ras Tanura to offshore installations such as Safaniya. The company’s equipment portfolio was further expanded and upgraded two years ago with the launch of its Blast Resistant Modules (BRMs) in Saudi Arabia. Manufactured in the region, Byrne’s BRMs (certified blast rating up to 10psi with a duration of up to 200 MS) are designed for hazardous operating environments such as refineries and petrochemical plants, and will safely and comfortably accommodate shutdown and maintenance personnel working temporarily on site. In addition to a major successful shutdowns in the Western Region in 2015, Byrne’s high specification BRMs have been deployed for the last two years at the recently commissioned ultra large Petrochemicals complex at Jubail-II, as well as the nearby petrochemical complexes in Jubail-I. 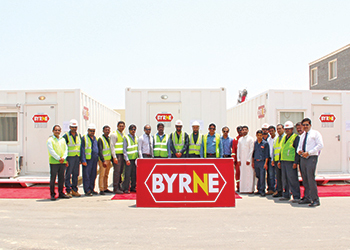 Having entered the Saudi market 15 years ago, Byrne Equipment Rental has been on a steady growth trajectory in the kingdom ever since, and has expanded both geographically as well as in terms of the equipment it offers. With the unique combination of flexibility, innovation and time saving advantage that Byrne offers it will continue to benefit an oil and gas industry facing daily pressure to rationalise their costs. With a track record of quality serving Aramco, its contractors and the wider oil and gas industry with distinction, the company continues to set the standard in equipment rental in Saudi Arabia, and is ideally placed to further support its customers wherever they operate, and for as long as they need world-class systems.